Go Fish is a great game for 2 to 6 people. This is how you set up the game: 5 cards (7 cards if only 2 people are playing) are dealt to each player from a standard 52-card deck. The balance of the deck is splayed out in the middle of the group. The object of Go Fish is to collect the most books out of all the players. Books consist of 4 cards of the same rank (4 Jacks for example). The player sitting to the dealer’s left goes first. He/she asks any specific player for a particular rank of cards (3s for example). Go Fish rules require that the asking player’s hand must contain a 3 if he/she is asking for a 3. The called-on player must give the requester all of the 3s in his/her hand. If the requester is successful in getting at least one 3, he/she takes another turn. If the player has none, he/she tells the requester to Go Fish. The requester than draws (fishes) any card from the splayed pile (pond). If a 3 (the requested rank) is fished from the pond, the player displays it to the others and takes another turn. When the player doesn’t get the requested card from asking or fishing, the person that was asked takes the next turn. In some variations of Go Fish, turns just go around clock-wise. Earned books are displayed face-up in front of the players and the game continues until a player runs out of cards or until the splayed pile is depleted. At this point, the winner is deemed to be the player possessing the most books. 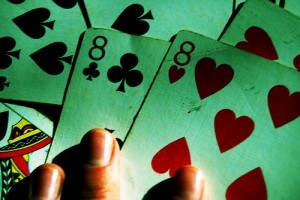 There is one major strategy in Go Fish that can help a player win: remember which players have asked for which cards! The more you know about other players’ hands, the better, because you can ask for those cards (as long as you have one) when it becomes your turn. Go Fish is a fun and easy game for all ages.